This is not your grandma’s green bean casserole… fresh haricot verts, baby portobello mushrooms, crispy shallots, and a creamy parmesan sauce come together to make the most flavorful and delicious dish. Heat a large skillet with olive oil. Add onions and saute until translucent. About 3-4 minutes. Add butter and mushrooms. Cook until softened, about 4 minutes. Season with salt and nutmeg. Add garlic. Cook another minute until garlic is fragrant. Add broth, scraping up any bits on the pan. Let some of the broth cook out for about 2 minutes. Stir in greek yogurt and parmesan cheese. Until smooth. Remove from heat. 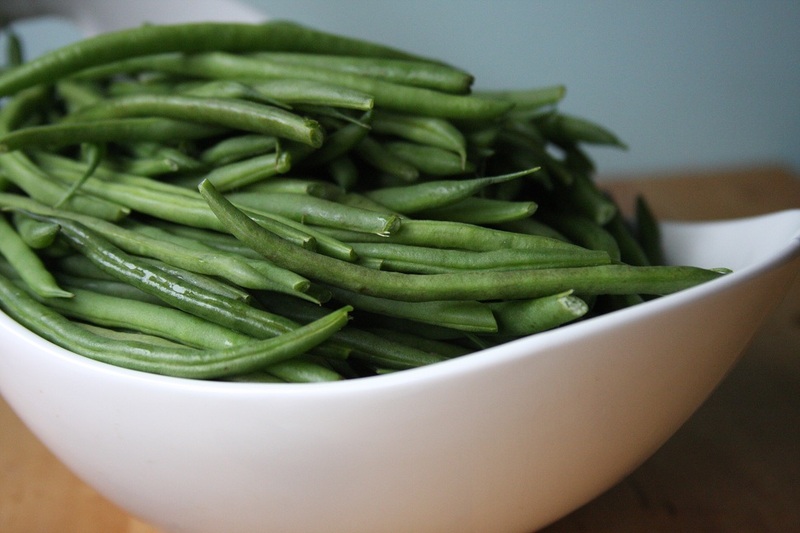 Fold in steamed green beans. Spread mixture into a 2 quart dish. Set aside and prepare topping. Combine topping ingredients, evenly coating shallots with cheese mixture. Sprinkle topping onto casserole and bake for 25-30 minutes until golden and bubbly. *this casserole will serve up to 8 guests. double the recipe if feeding a crowd! Don’t forget about dessert! Check out my Chocolate Brownie Icecream Cake and Maple Pecan Pie! Thank you Michelle, My fam never really liked that old GB Casserole recipe anyway. This looks good, but I will have to leave out the mushrooms for Christina. I still love your Grandmas sweet potato recipe. 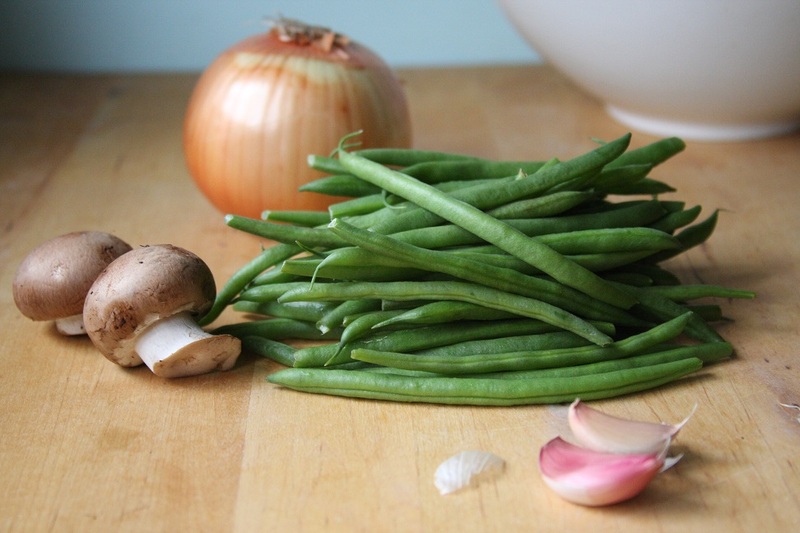 Thanks for sharing Jeanne P.
I would suggest using 1 1/2lbs green beans to compensate for leaving out the mushrooms. Also, if you do not have almond flour for the topping, you could easily use finely chopped almonds, regular breadcrumbs or even panko breadcrumbs which will give it a nice crunch! (being that none of you are gluten free). I love that you use my Grandma’s sweet potato recipe, it really is amazing. Thank you SO much for this recipe. One of my favorite things about Thanksgiving is Green Bean Casserole. Now I can have some. This recipe was Fabulous for Thanksgiving this year! So much better than the standard green bean with cream of mushroom soup & fried onions. What a healthy alternative and so much appreciated by everyone at our table! Thanks Kathy! Glad everyone enjoyed it. Hope you had a wonderful holiday! My partner and I made this recipe for a Thanksgiving potluck, and let me tell you, every single person there loved it! 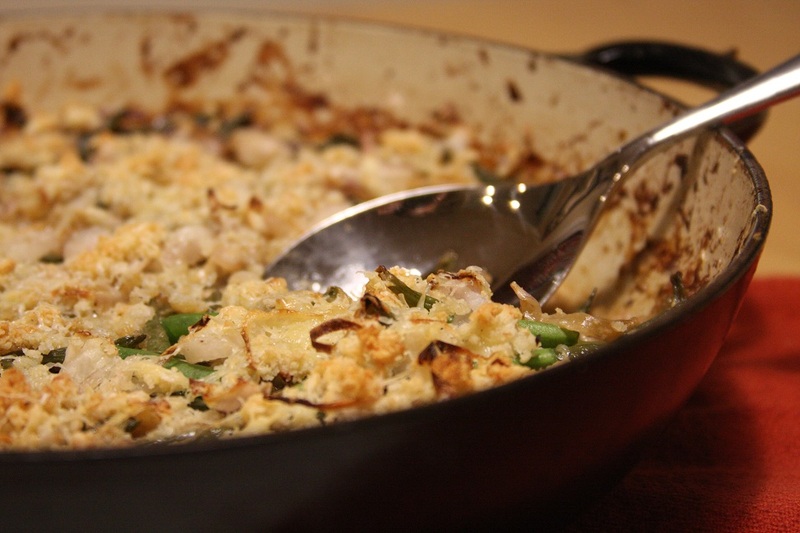 Thank you so much–it’s so delicious and on a whole other level than the usual green bean casserole. People raved! Yeah! :) That is awesome, thanks so much for the lovely feedback! it again. Thanks so much. Also, what kind of broth do you use in the green bean casserole ? I used turkey broth, b/c I had just made a large batch. However, chicken or vegetable broth would both be suitable. I made this for our Thanksgiving dinner and everyone loved it. Even the leftovers were good cold. :> Thanks. I hope this turns out good! I am making it now. The topping mix didn’t work out so well I hope its yummy! 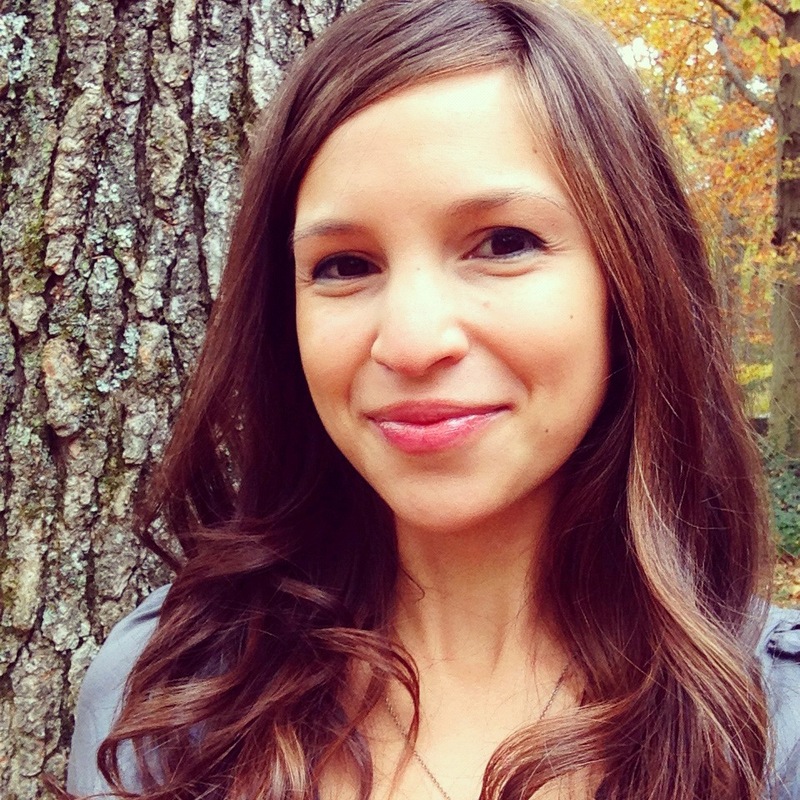 After surfing the Internet for autumn recipes for a bit, I stumbled across your blog. Let’s just say I am THRILLED to have found it! I have already bookmarked more than ten recipes, and so thankful to have found someone who can make healthy dishes that don’t sacrifice taste! My family and I have been making the switch to whole-foods for some time now, but have found that some recipes lack luster. Yours are brilliant. Thank you so much, and keep posting! What kind of greek yogurt did you use. Do you make your own. I know on SCD it is supposed to be fermented for 24 hrs. Just curious. The recipe looks delicious.